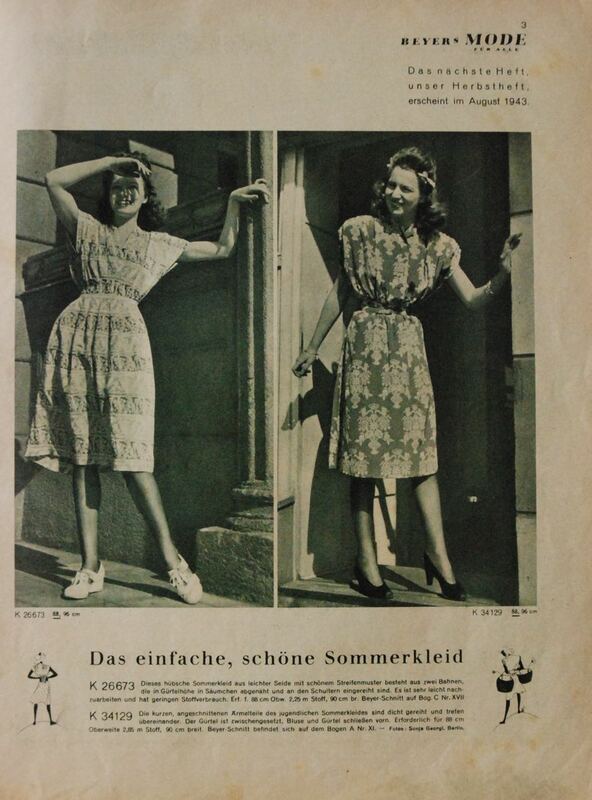 And here it is: My dress from the magazine Beyer's Mode from the summer of 1943! 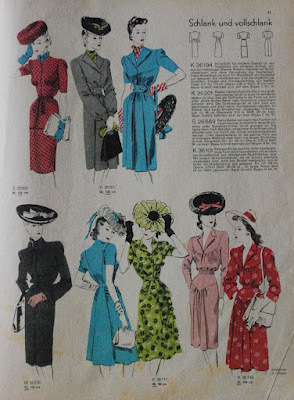 The fifth item for this year's Vintage Sewing Pattern Pledge (I didn't pledge a specific number of projects this year, but in the past two years five was the target number. 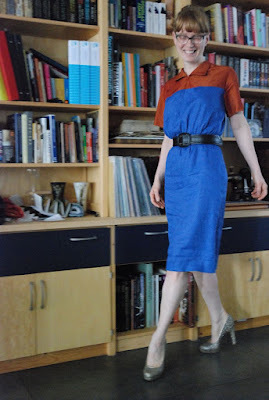 So, I am doing pretty well when it comes to vintage sewing). 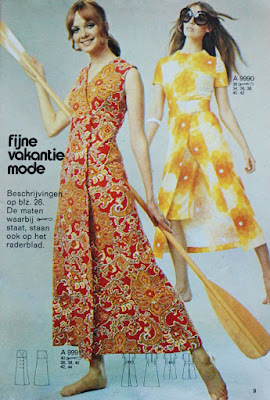 I have talked about the magazine, the pattern and my alterations in earlier posts. 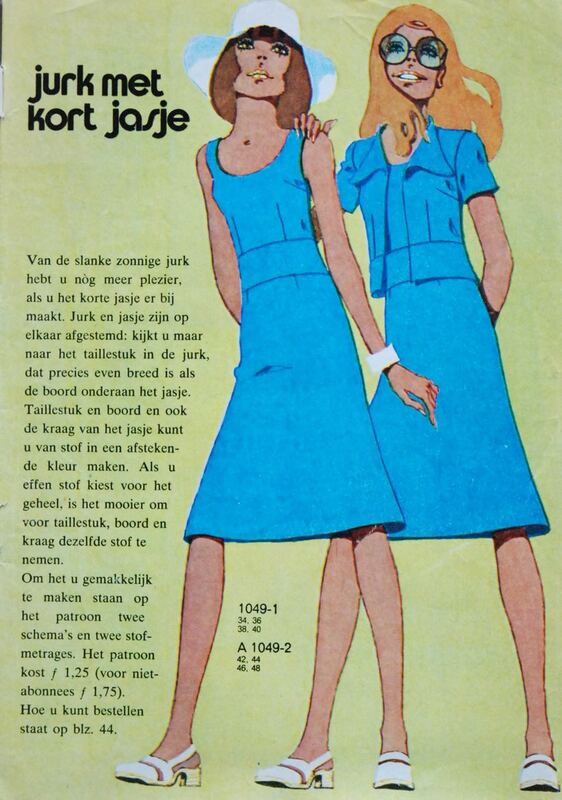 I didn't mention before that this dress is supposed to have thin shoulder pads which you can make using the pattern piece from another dress pattern from the same magazine. I didn't make the shoulder pad. The shoulders don't look too high or too wide (and I know my shoulders are just a little bit on the square side for some patterns) so I only found out about the pads when the dress was almost finished and I read the four, very short, lines of instructions printed on the pattern sheet. Of course, small shoulder pads might give the dress a more full-on 1940's silhouette but to me, it is much more wearable without. And even without that added shoulder shaping, I was actually surprised at how closely the end result resembles that little drawing. 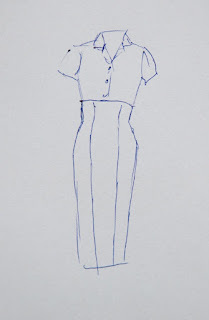 Fashion drawings are notorious for giving an idealized image which may have nothing to do with the real item of clothing. 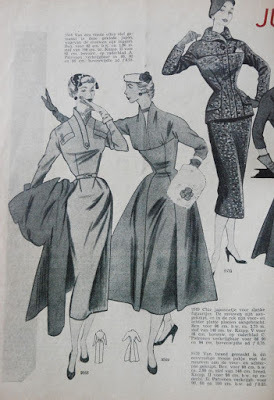 Illustration ladies tend to be so tall, thin and curved that no real person can hope to live up to their example. 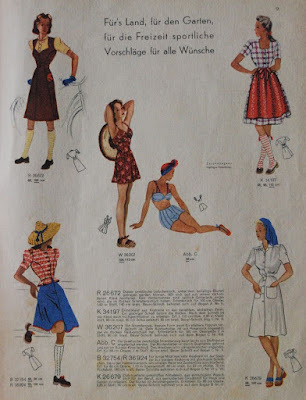 It is one of the great issues for anyone who is starting to sew: You pick your pattern based on those nice pictures and get disappointed by the results again and again (I am among those who would recommend beginners to start with patterns illustrated with photographs but for vintage patterns, that is often not an option). I've never worn a dress with such a bloused bodice before so I didn't really know what to expect. I was afraid it would make me look to bulky up top (even with my small bust size!) but the toile already told me this one doesn't. And if you belt the dress (like you're supposed to do) that wide top really helps to give the impression of a tiny waist. 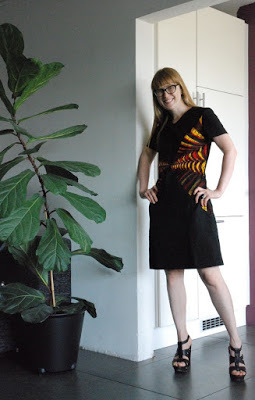 To allow the blousing to work well, I made a complicated side closure for this dress: There is an invisible zipper in skirt part and a snap placket in the top. Oh, and the original design has pockets. I love pockets as much as the next girl but I decided against adding them in this dress. 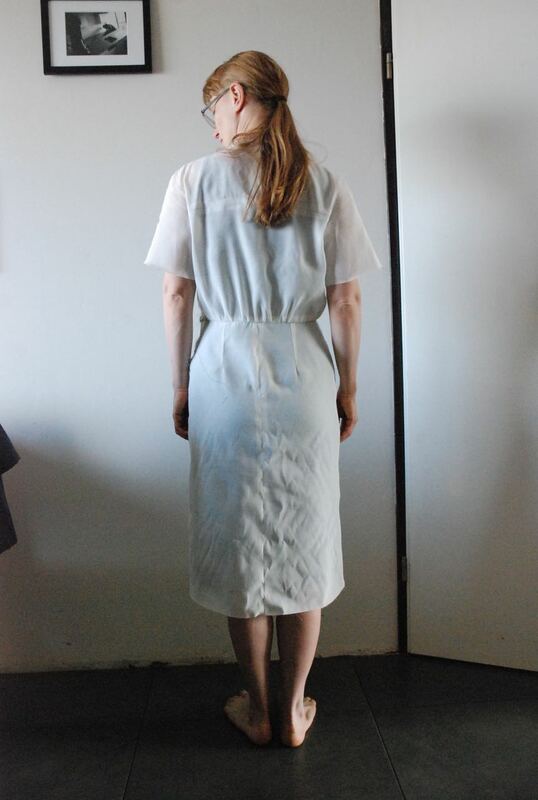 Double welt pockets in a fairly slim fitting skirt in linen seemed rather risky AND I didn't think their position, pretty much directly over the wearer's groin, would be very flattering. The fabrics I chose both came from my stash: the yoke (which is cut in one with the sleeves, even though the illustration suggests an inserted sleeve) and collar are made from the mystery blend I bought for my 1929 dress and for the rest of the dress I used a blue/purple linen which I think I bought in the summer of 2014. Being linen, it does crease easily but it is also very comfortable in warm weather. There is something I always slightly worry about with color-blocked designs. Star Trek uniform. I loved Star Trek as teenager, still do when I happen to watch it again. However, that doesn't mean I want to look like I am on my way to a fan convention on any random day. It is one of the reasons why I've always stayed away from black clothes with colourful yokes. 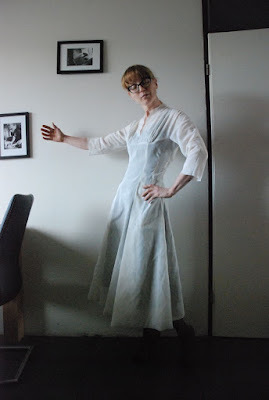 I don't have time for a proper blog post about my new dress tonight (although I did take pictures this morning) but I thought this might not be completely off-topic. 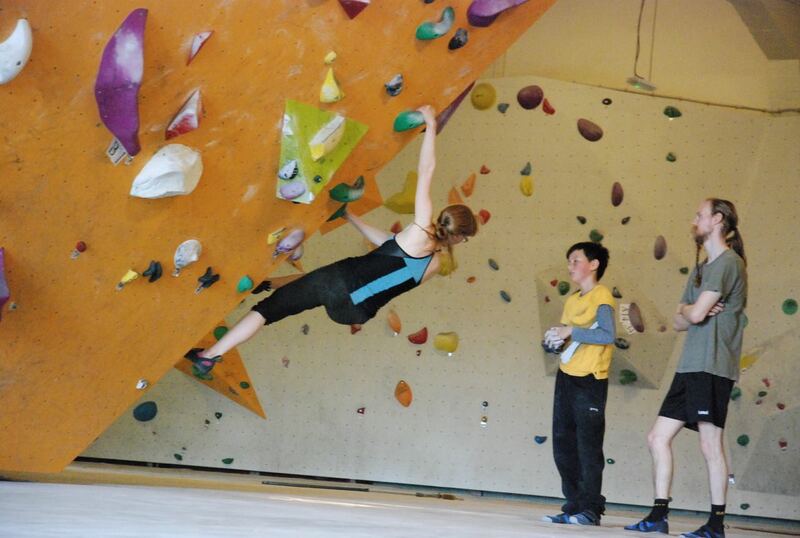 Today, E and I took my brother J and my cousin D bouldering. We took some pictures just because it was fun. Just some bits of hand sewing to go and then the 1943 dress will be done! 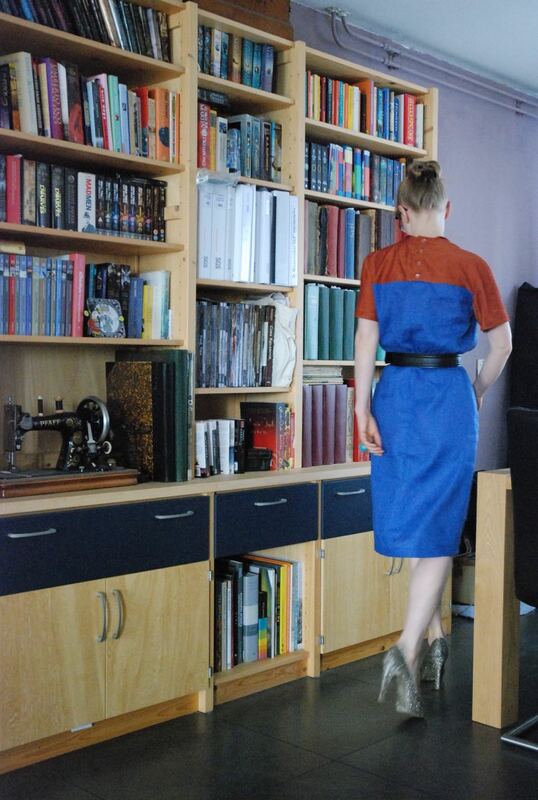 There are so many different fasteners in this one dress... I'll show them to you later. This dress is a very different look for me. I like it but I'm not completely convinced yet. The proof will, as usually be in the wearing. Progress is fairly slow because I've been busy with other things. And yet, I am thinking ahead to next sewing projects. I will have to re-make some of E's summer trousers because the old ones don't fit well anymore. Actually, that should be my next project. Although it's not that warm at the moment, it is almost June so he is definitely going to need more summer clothes soon. It has been clear that I will have to re-make my slopers for a while but I didn't want to do it straight away. No use drafting new slopers only to have to replace them again a couple of months later. 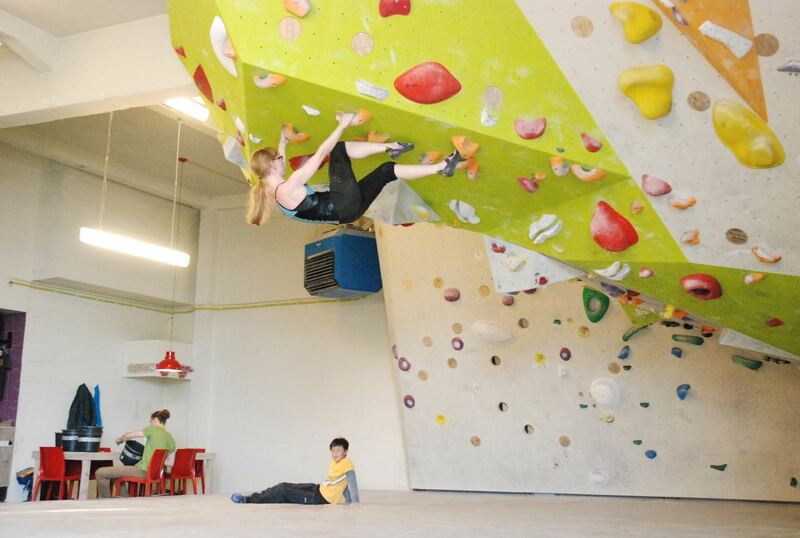 However, if I don't start taking any serious "strength for bouldering" training sessions (there are several on offer right now. I am serious about becoming a better climber but most of these seem to focus on strong arms while I think I have most to gain by improving my technique, understanding and core strength) I think my shape should be stable. After all, my body is used to climbing three times a week now. In fact, I guess I should even take another look at my bra block... I haven't gone down a whole size but I think it might be wise to adjust the fit a little bit before making new bras. If I don't feel like drafting new slopers, there are several vintage patterns I could consider sewing up. Like the two 1940's dresses I pointed out in the previous post. 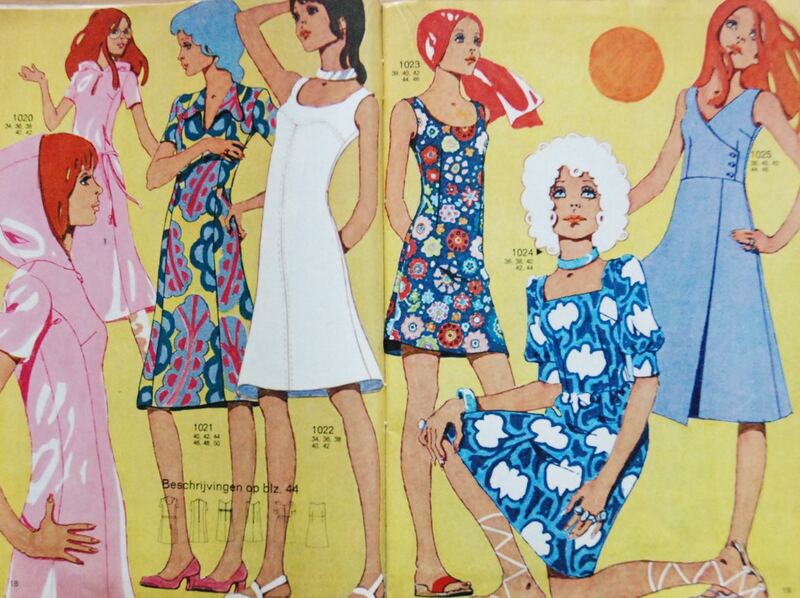 Or more 1960's shift dresses. They also make great summer clothes. And my old slopers are not so far off in size I can't use them anymore. They are still fine for designs which are either tried-and-tested so I can easily judge how to alter them while drafting or easy to adjust while sewing. 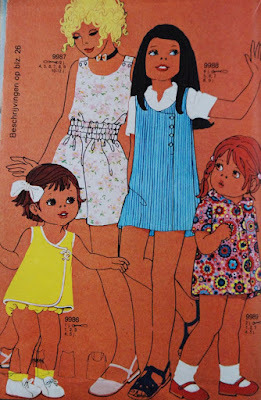 In particular, I am thinking about making a simple summer dress using both jersey and a woven fabric. This is what I had in mind all along. Blue jersey for the bodice and either a matching blue cotton or a print with that blue in it for the skirt. 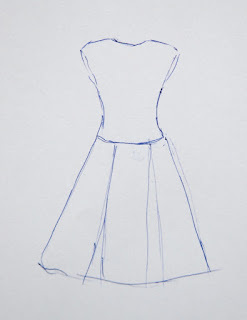 The skirt itself can be a half circle or pleated (also depending on the fabric choice. One of the two printed fabrics I am considering is really narrow). And then, last week, I just thought of this option. I think I have some black pointe knit left over which might be enough for this skirt and for the bodice I could use that black cotton with the white dots/stars which I didn't end up using for the yoke of my 1952 blouse. There should be just enough of it. 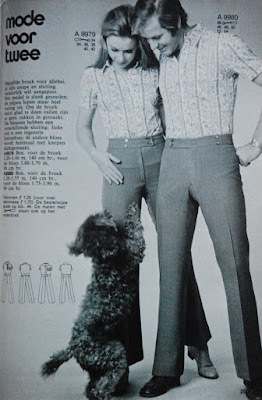 I am not entirely sure about this style for me though... It might be just a bit ehhh... "mutton dressed as lamb". What do you think? Of course, especially because it could be made using leftover bits of stash fabric I could just try. If it works, it work and if it doesn't I don't really loose anything. 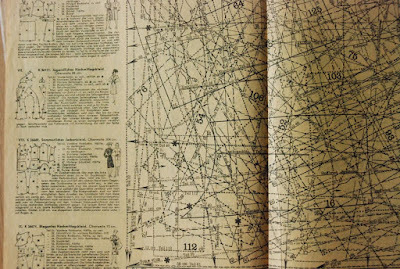 So many plans, so little time. The dress I'm making is coming along nicely but it is not finished yet. 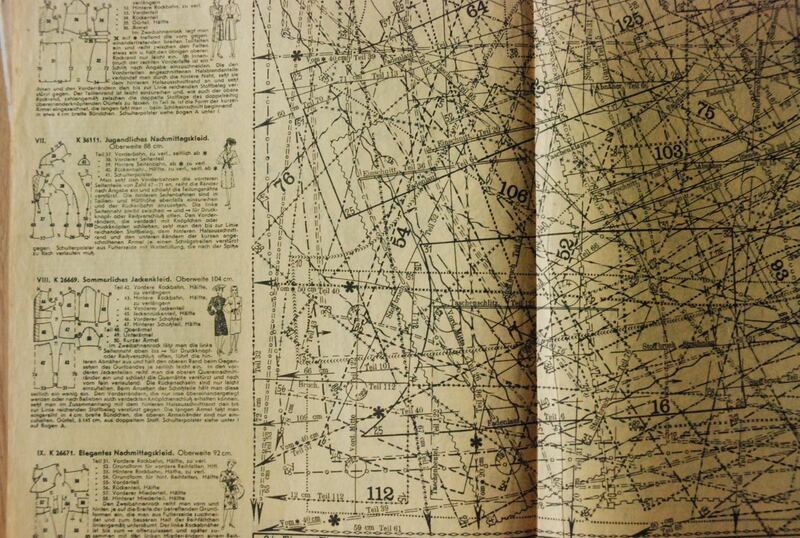 However, I thought you might like a look inside the magazine the pattern came from. Beyer's Mode for summer 1943. In more quiet times, this magazine was published monthly but wartime imposed restrictions (This is a German magazine which came from the collection of a professional seamstress in Noord-Holland. 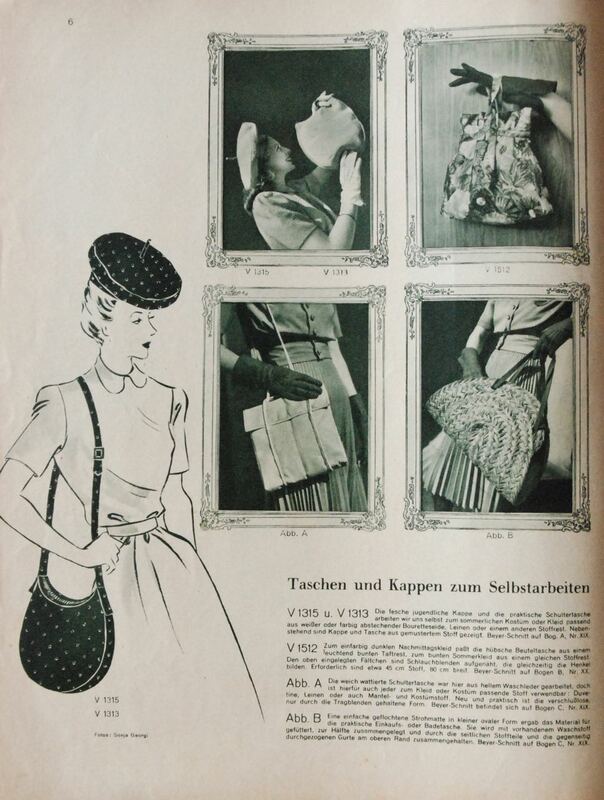 I have written about the consideration of a Dutch woman buying German wares during the occupation before but I think she was always going for magazines with lots of patterns and Beyer's Mode was strictly a-political as far as I can tell from the magazines she owned) and it was reduced to just four issues a year. 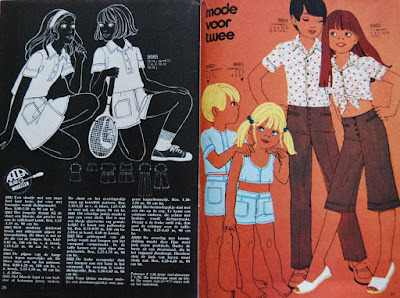 Some of the designs are illustrated with photographs. But the vast majority with fashion drawings. 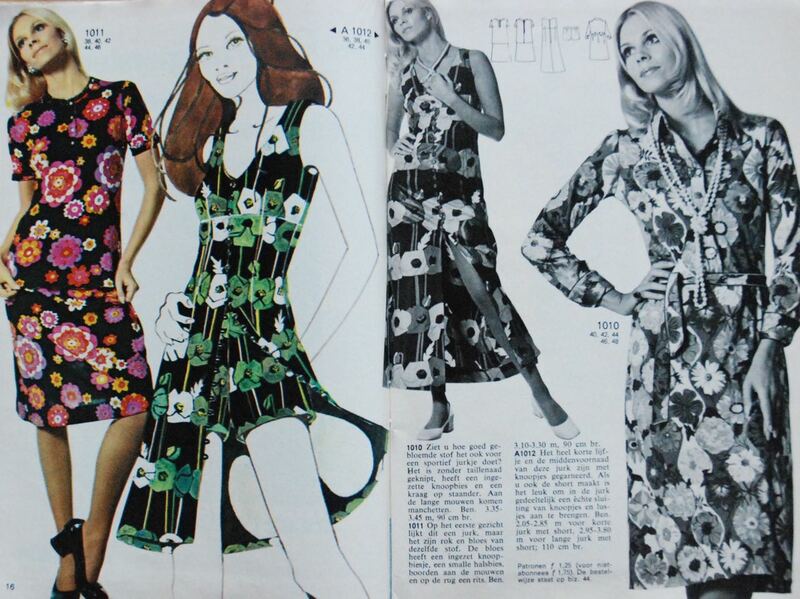 There, on the bottom left, is the dress I'm making. 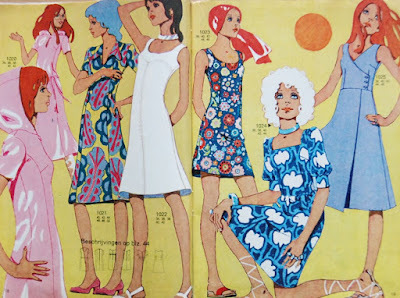 Like all sewing magazines up to the mid-1960's (based on my experience, that is) Beyer's Mode does not include multisize patterns. 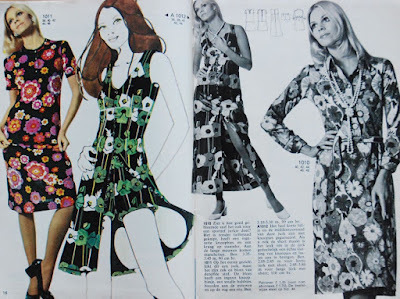 Each design was available in two or three sizes and included on the pattern sheet in one of those. The bust measurements are printed next to each design and the underlined number is that of the size on the pattern sheet. My size is bust 88 cm. Which means that this magazine includes several nice dresses for me. And with the first one looking promising, I am starting to eye up others. 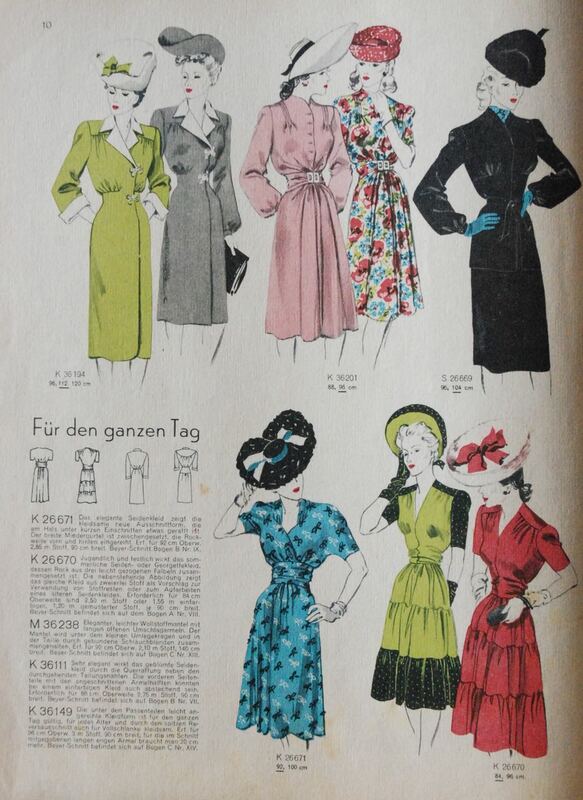 The dress on the bottom right of this page is also in my size. I'm not so sure about the tiered skirt. The bodice would required a soft, drape-y fabric but I think that would make a skirt design like that look a bit sad. I like the bodice though. Such a quintessential 1940's shape. 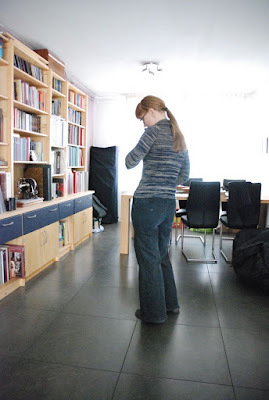 And I think it would also look very nice with a skirt like that of the dress next to it (which is not in my size, but such a shape would be easy to make using the pattern pieces of the dress I am making now). 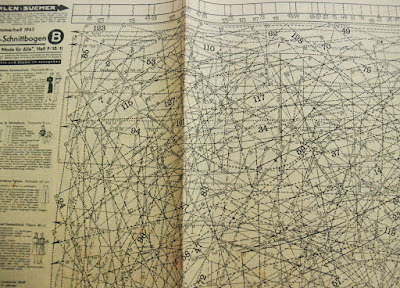 And this is the pattern sheet. Quite densely printed but at least the ink is still black. I have an issue from the late 1930's in which it has faded a bit. And I didn't have much trouble tracing that first pattern. 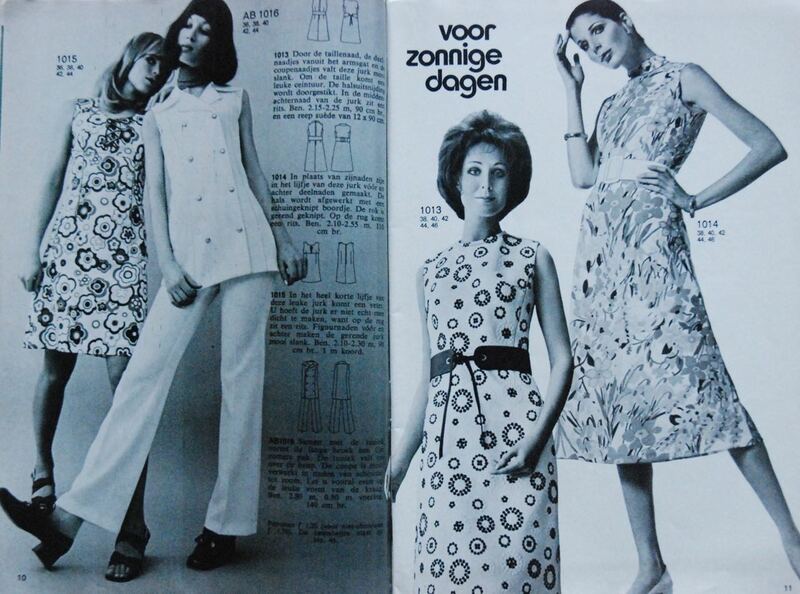 In fact, this magazine originally came with two pattern sheets. Sides A,B,C and D. Only one, with sides A and B is still there. Luckily for me, this one sheet contains four of the five dress patterns in my size (both dresses in the photographs are in my size but the one on the left is not there) and a blouse. The only thing really missing is that cute two-piece beach outfit. A bit of a break from vintage pattern projects and indeed, in a way, from sewing in general. Just in case you may have wondered why I didn't seem as productive as usual for the past two week, this is the reason. I've been working on this little cardigan. I made it on my knitting machine using two strands of very thin blue yarn and one of thin beige. The three together still make for such fine knitting that it would take me ages to do it by hand (I can knit by hand but neither well nor fast). 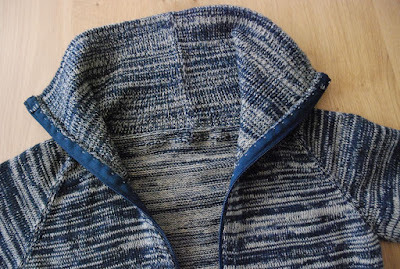 It is a pretty basic garment, maybe the kind of thing that might make you wonder why I would bother making it myself. Well, I did because I can. And because I've been using my sporty cardigans a lot lately and wondered if I should add a knitted one to the collection. Long raglan sleeves, a back bodice, a front bodice in two halves connected by a zipper and fairly high collar. That's it. Not much different from lots of little cardigans out there. I'm still proud of it though. I made this pattern myself. Calculated how many stitches in how many rows would be needed. I've done this a couple of times before but I'm still pleased when it works out. The knitting itself went pretty quickly. It's the sewing together that usually seems to take forever but even that was OK this time. The thing that took a lot more time than expected was putting in the zipper. I had knitted a few stitches extra at the center fronts to sew the zipper to. I had decided to do that using the sewing machine. And I did. But unfortunately, I had stitched so close to the zipper teeth that the zipper didn't work. It would have been fine for a normal fabric but not for the more loose structure of knit work. So, I had to unpick the entire zipper which was not a nice thing to do at all. I re-stitched it a bit further away from the teeth and then sewed the knitted seam allowance to the back of the front bodice pieces by hand. And then, I prickstitched the edges of the zipper tape to the seam allowance. Even after that, I did not end up with a finish on the zipper I would have been happy with in my sewing. And yet, I don't think I mind. Before you get into this blog post, let me just apologize for the pictures... 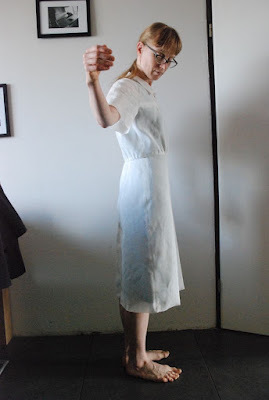 I asked E to take some quick snaps of my toile for the 1940's dress and he did. Very quickly. Clearly, he never zoomed the camera out of its wide-angle setting which causes weird distortions and neither of us noticed how the light seems to highlight my bare feet (made to look even larger by the already mentioned wide-angle effect...). 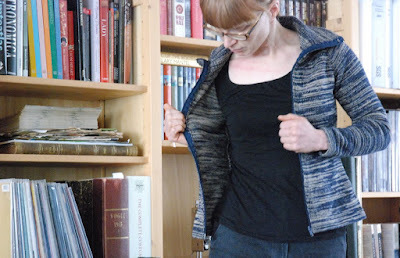 But despite all that, these pictures do work to illustrate the fit of this pattern. And in fact, I was pleasantly surprised. 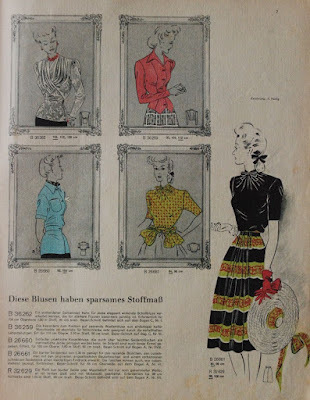 I have often read about how 1940's patterns can have huge amounts of ease in the bodice. This one is blouse-y but not crazily so. And I sometimes have issues with pattern companies assuming proportions which are very far from mine. This thing seems to be fairly close at least. There are a couple of issues, which you will no doubt spot, but they all seem to come from the thing. An issue I definitely didn't expect: The front bodice is too short. That is an issue I would mostly associate with the problems of larger bust sizes so I didn't expect to find it on little old me. And yet here it is, clear as day. 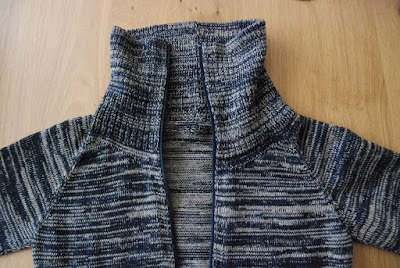 It didn't seem so bad before I pinned the opening at the back neck so I wondered if it was just caused by a too tight back neck or a short back pulling at the front. However, with the back opening closed, the seam over the top of the shoulder and arm looks pretty straight so it really is a front issue. Based on the fit like this, I will have to add about 2.5 cm at center front, tapering to nothing at the sides. And I'm not even wearing a bra here so I guess it might be wise to add even a little bit more. I think I will add about 2 cm of that at the front yoke which seems to be pulling up a bit. The other issues visible here look like consequences of the too short front bodice so I think they will get solved automatically when I solve that. They are a weird flare to the front in the skirt and too wide bit of skirt just below the waist seam. In fact, there are two items from that effort which haven't been sewn up yet. There is the lovely dress from Bella magazine, for which I made a toile and there is a dress from Beyer's Mode from 1943 which has not seen any progress after tracing. I still love that dress from Bella and I have made the necessary adjustments to the pattern but I'm still not sure about what kind of fabric would be best for it (other than the dress-weight wool it is described for). And it actually is a winter dress. A different choice of fabric could, of course, shift it to spring or autumn but making it suitable for summer would mean cutting those sleeves short. And I think I rather like them the way they are. The dress from Beyer's Mode is a very different story. It originally came at the bottom of the to-make list because it is a summer dress. In early March, summer seemed far away. So, NOW seems like a perfect time to get started on this little number. 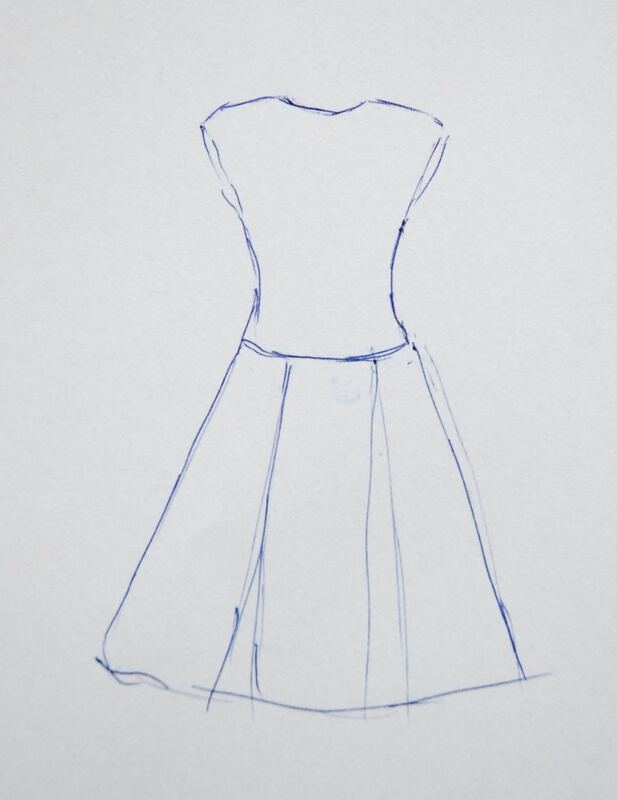 It will be my first "real" 1940's dress. By which I mean that I may have made designs from after the introduction and acceptance of the New Look (Dior's bold break with the fashion of the previous years initially met with a lot of resistance but after about a year, most ladies did agree that the longer, fuller skirts and sloping shoulder were actually pretty) at the end of the decade but of course, those already have the silhouette the 1950's are known for. I have never before made a dress which was designed just before, during or a short time after the Second World War. 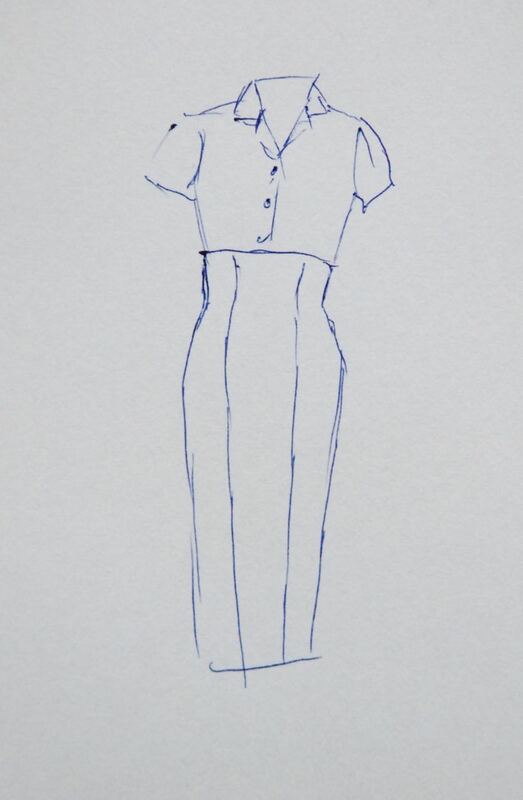 And this one has all the hallmarks of the era: shortish A-line skirt, slightly bloused top with square shoulders and it uses two different fabrics which makes it a very suitable design to update an old dress or to use up left-over bits of fabric. It is not a look I am sure about. 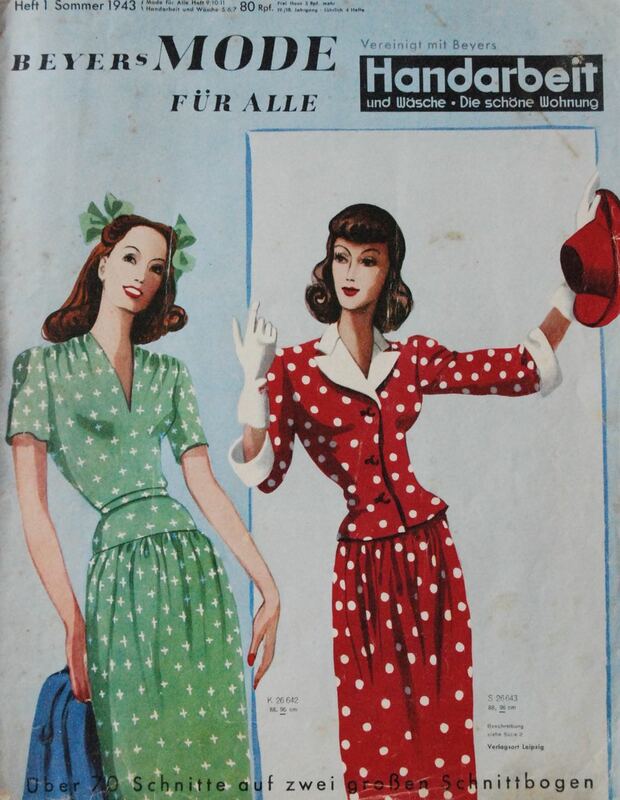 I have seen other ladies who look great in their 1940's dresses but I'm not sure the look will suit me. So, all the more reason to try it out! 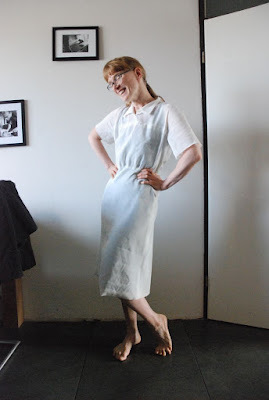 - Oh no, that's not true: I made a dress for last year's Vintage Sewing Pattern Pledge using a reproduction of a pattern from 1946! Oh, and you may have noticed from the title (or you may be familiar with it) but Beyer's Mode is a German magazine. I have written about this before: Despite being published throughout the time the nazi's were in power, Beyer's Mode is strictly a-political. 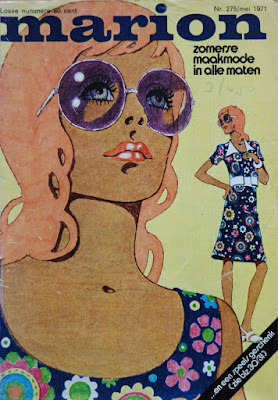 In fact, the references made to the "challenges of the time" are very similar in tone to those in Dutch magazines which were published during the occupation. And, interestingly, fashion in the 1940's doesn't seem to pick sides... 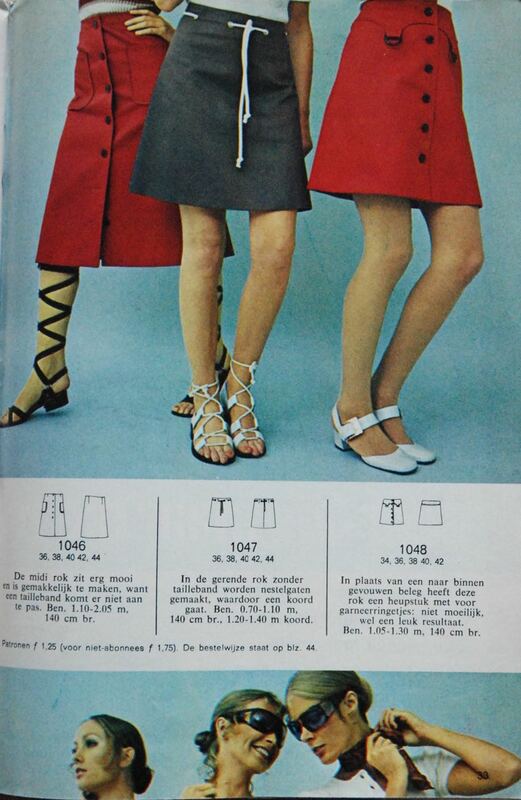 The looks in this magazine are very similar to those in fashion images from the UK and the US in the same year. It's not really surprising I suppose, common fashion history states that, with the exclusion of austerity measures, fashion kind of "froze" during the war. Anyway, this dress is going to be my next project. 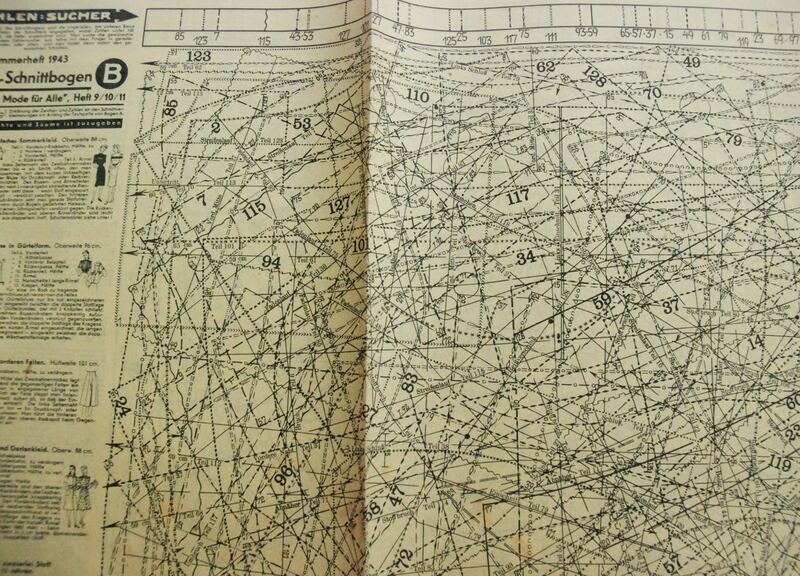 Beyer's tracing sheets are unusually densely printed but despite that wasn't very difficult to trace the pattern. The relatively small pieces helped, and the fact that I bought my new roll of tracing paper at a different place than usual and their product seems to be a bit more sheer. I will have time to make a toile tomorrow, then I will try and find some suitable fabric in my stash and hopefully sew it up this weekend. After about a week at the end of April in which winter seemed to be back, this week feels like summer is already here. Of course, the only thing you can really rely on about the weather here in the Netherlands, is that it's unreliable. So, there is no real reason to complain about either of these extremes. It's still a big change though. I went from wearing my winter coat a week and a half ago, to my 1960's summer dress today. These few early hot days have made me think about my summer sewing. 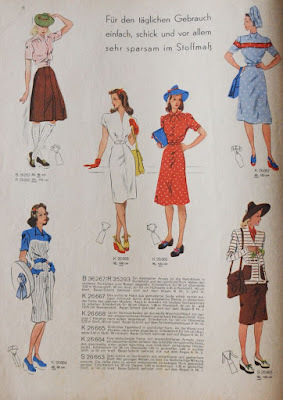 As you know, I'm quite fond of 1950's style dresses and separates most of the year but not so much in hot weather. No matter how summer-y the look or how thin and airy the fabric (lots of nice cotton) fitted bodices and big skirts are just not the coolest option out there. They are great moderate summer days but not for the really hot ones. I may not need a lot of true hot weather clothes but it is nice to consider what those should be, just in case I would decide to make more. 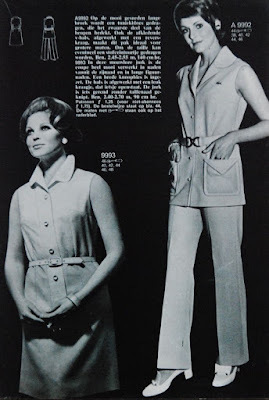 My ultimate heat wave outfits are two little cropped jumpsuits/playsuits. 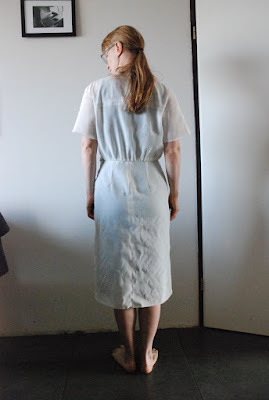 Loose, baggy shapes made from thin viscose/rayon which expose a lot of leg. The other one has a spaghetti strap top. This little number comes in at a close second. It is also a jumpsuit/playsuit but the shape is very different. 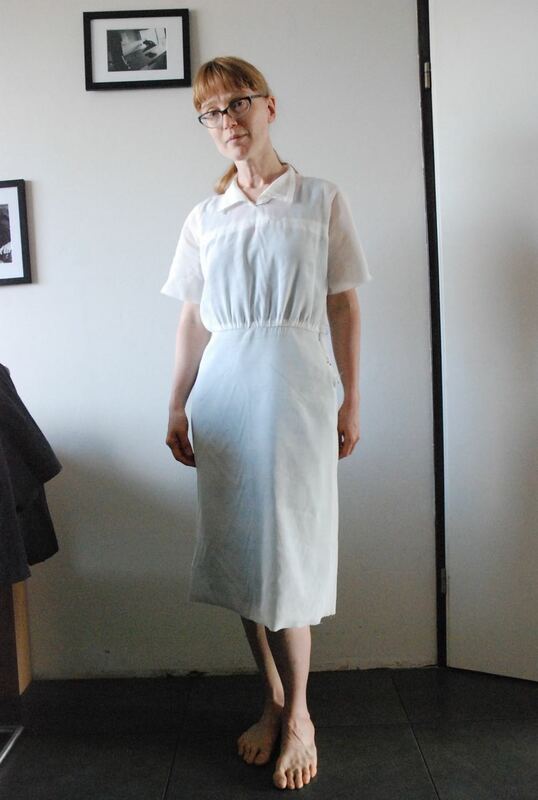 The top part is a tube top made from cotton jersey, the bottom is made from linen, using a culotte pattern. I tend to exclude jersey from my personal list of best fabrics in hot weather because it will always have more bulk than a woven fabric from the same fiber. However, it has never bothered me in this case. Maybe it's because of the bare shoulders. 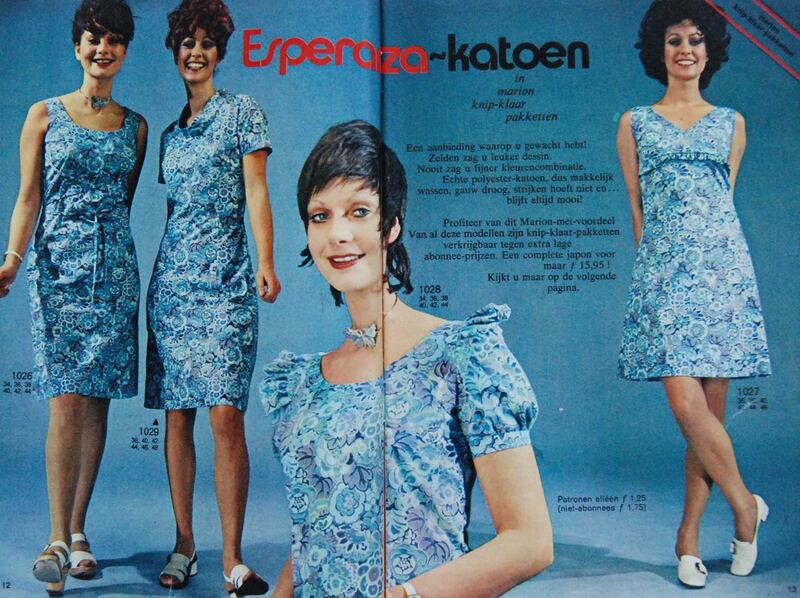 And then, last year, I discovered 1960's dresses (this is the dress I am wearing right now). That is something I owe to the Vintage Sewing Pattern Pledge. 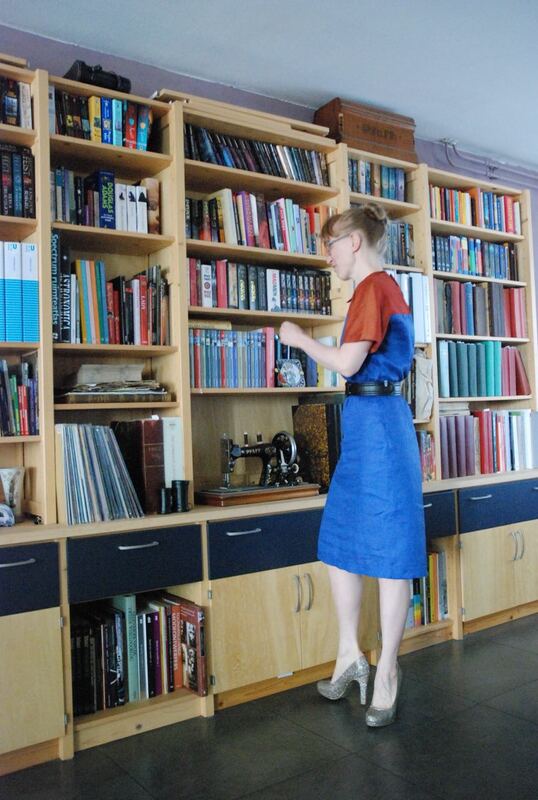 I made two dresses from magazines in my collection which were both great in the middle of summer. 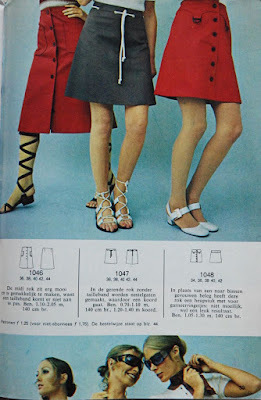 Most magazines in my collection are from the mid-60's when skirts weren't quite as short as we would expect them to be. 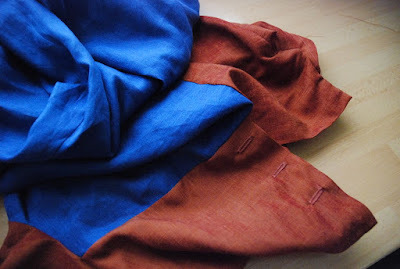 In cotton or linen, these are great for summer and I think I will make more this year. 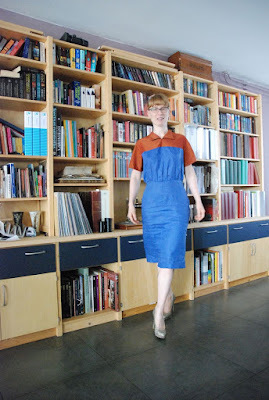 Two years ago, I had yet another summer experiment: A bias cut dress. Made from thin and airy viscose, this one is wonderful to wear in warm weather despite the long skirt. I never thought I was quite finished with this topic so maybe it is time to try again. This is my existing summer line-up and I think I will add to the dresses this year. I may continue on the roads already taken, or try something new. Some floaty 1970's looks seem appealing or maybe I can try 1930's again? Or maybe something very modern? As for fabrics, I am never fond of synthetics but really avoid them in summer. I like cotton but I think linen and viscose/rayon are even cooler to wear. I don't have a lot of experience with silk but I have some pieces hidden away in my stash. It's supposed to be great for summer wear. Last week, it felt like winter had come back but this week is different. Very different. Now, it actually feels like late spring. The sky is often blue, it is sunny, the local supermarkets are already offering everything for the barbecue and sometimes you can actually walk outside without a coat! 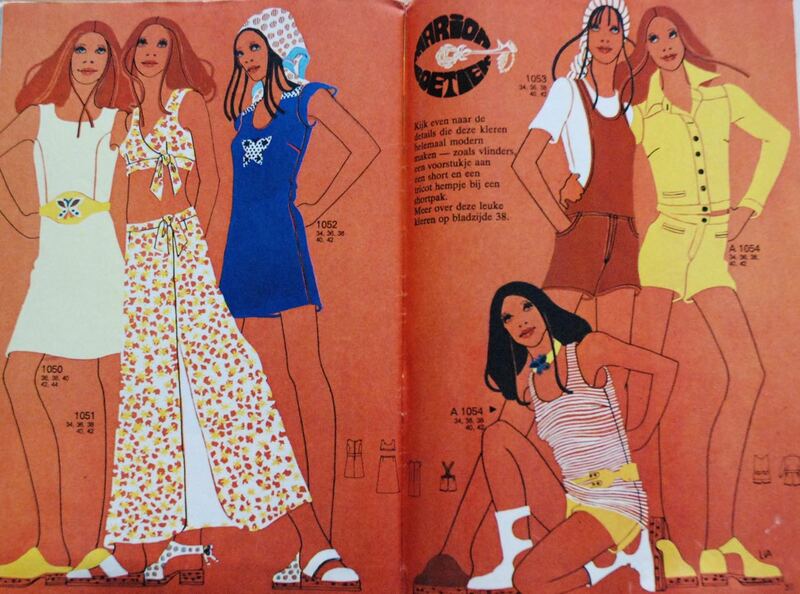 Of course, the good weather should make me think about summer sewing... I haven't really decided on anything yet. 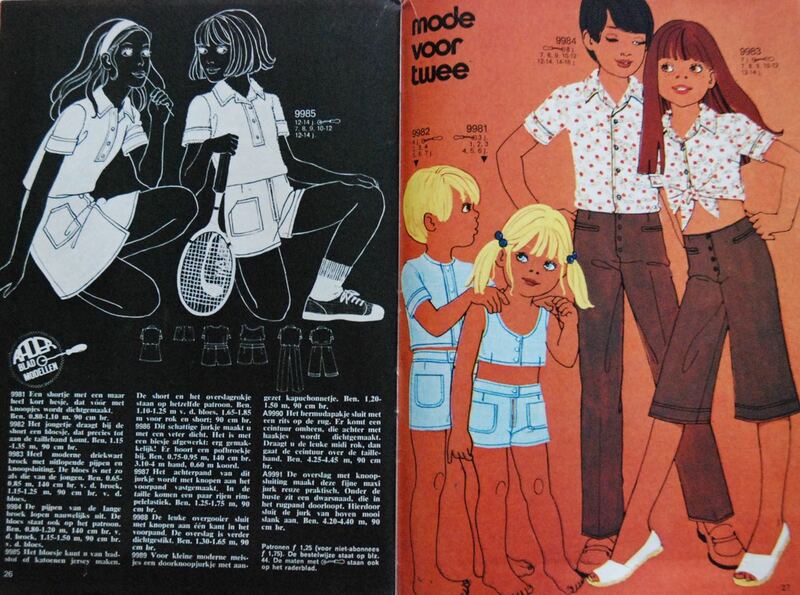 The style of the illustrations in 1970's Marion is pretty goofy and then there are the prints in the photographs! However, if you look past all that, there are a lot of clean, simple designs which would probably still work today. I don't think I will sew anything from this particular magazine any time soon. However, 1970's is a decade I still haven't visited in nearly two-and-a-half years of participating in the Vintage Sewing Pattern Pledge, so I will be looking at more of it.